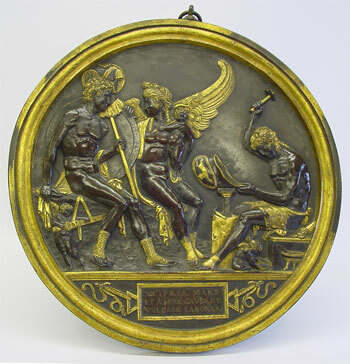 This rare and important early Renaissance roundel, 42cms in diameter, depicts Mars, Venus and Vulcan, with Cupid and two amoretti in attendance. Our conservation work began with investigation of the bronze surface under a microscope, which revealed previously unidentified areas of silver inlay, particularly on the shield of Mars and the eye of Vulcan. All the silver areas found were carefully cleaned to remove tarnish, and all the gilding cleaned to remove copper corrosion. 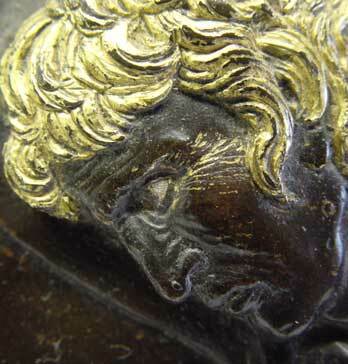 The bronze surface was then cleaned to remove dirt, old wax and hard, very small copper sulphate-based pustules. Small areas of the patina had been rubbed through, so these areas were carefully chemically matched to the surrounding original patina. The high quality of the workmanship suggests an author with a background as a goldsmith. It has been suggested that the piece is attributable to 'Antico' or Gian Marco Cavalli, however the attribution cannot be confirmed.